James O’Keefe strikes again. This time at Vassar and Oberlin. A female reporter went to administrators and professors at each university and said that the Constitution frightened her. That she felt “triggered” by its distribution on campus and found it oppressive. These educational professionals then literally shredded the Constitution for her, page by page. They agreed with the reporter that the founding document was racist and harmful. Sentiments on banning it were also conveyed. If someone had come to me like that, I would have laughed at them and said, ‘You are joking, right?’ But that’s not what these Marxists did. They sympathized with the hatred of the Constitution and facilitated the destruction of the document this country was based upon. That pretty much says it all. Administrators at Vassar College agreed to personally shred a pocket Constitution after an undercover reporter posing as a student complained that she felt “triggered” by its distribution on campus, while professors at Oberlin College confided that they shared the reporter’s misgivings about the founding document. Noting that “I’m sure there are also some people who, who maybe don’t understand the impact that this might have on folks,” Grab asks the reporter whether there is anything that can be done to create an “educational moment” regarding the issue. Grab stops short of endorsing that idea, but asks the reporter if there is anything she can do with the copy of the Constitution that was brought into the office. “Honestly, can we just like destroy—like is there a shredder or something? Like I think it might be really therapeutic,” the reporter offers. 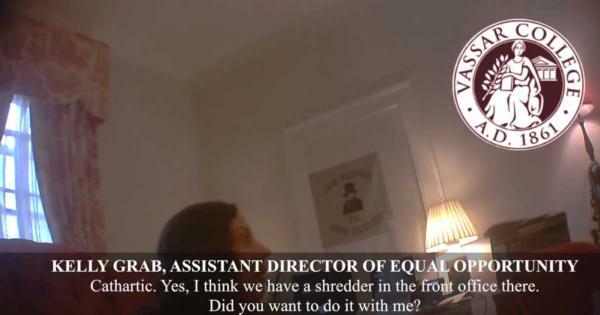 The video then show Grab and the reporter enter another office, where Grab proceeds to shred the entire Constitution, page by page. A narrator then asserts that when the reporter tried the same story at Oberlin College, several professors made similarly shocking statements. When the complaint was brought to Wendy Kozol, Professor/Chair of Comparative American Studies at Oberlin, she agreed after a long pause that “[t]he Constitution in everyday life causes people pain,” adding that she rarely discusses the Constitution in class, and that when she does she tends to focus on specific amendments. Carol Lasser, Professor of History and Director of Gender, Sexuality, and Feminist Studies at Oberlin, likewise concurred that “[t]he Constitution is an oppressive document” because it intentionally makes change a slow process. Colleen Cohen, Faculty Director of Affirmative Action and a Professor of Anthropology at Vassar, is even more indulgent of the reporter’s complaint, saying, “[i]t’s horrible that this is something that has caused you such pain,” and despairing that “unless the people are from off campus,” there is nothing the college can do to prevent the Constitution from being distributed. Gee, I wonder if a student had a ‘panic attack’ over the Bible, would they shred that too? Oh wait… how about the Quran? This is insane it shows an utter lack of respect for all those men and women who gave their lives so the freest country on the planet could come into being. And this is what it’s come to… so much political correctness it makes your eyes cross. Pathetic. This is what our kids are learning in college. Notice how these professors love birthright citizenship and hate the Second Amendment as it was intended. Actually, they may be professors, but they are incredibly stupid and uneducated along with being biased and Marxist. Without education, we are in a horrible and deadly danger of taking educated people seriously.’ G.K. Chesterton.